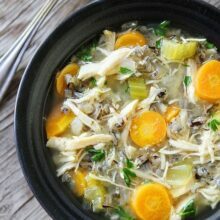 Slow Cooker Chicken and Wild Rice Soup-a healthy and hearty soup that is made in the slow cooker! I’ll be honest, I’ve never been a slow cooker fan. I don’t know why. I love the idea of throwing everything in the slow cooker and walking away. I guess I was just too lazy to get it out. Now that’s it out, we can’t stop. We are loving our slow cooker! Josh actually created this recipe. He doesn’t think I give him enough credit on the blog, so just so you all know, this is Josh’s recipe:) He loves Chicken and Wild Rice Soup and decided to try it in the slow cooker since we both had crazy busy days. Neither of us wanted to fuss with dinner. He threw all of the ingredients in the slow cooker and let it do the work! We worked all day while the slow cooker made our dinner! The soup has onion, garlic, carrots, celery, chicken, wild rice, broth, thyme, and parsley. We used carrots from our own garden too! Aren’t they cute? This soup is perfect for a cold day and is a great soup for when you are feeling under the weather. 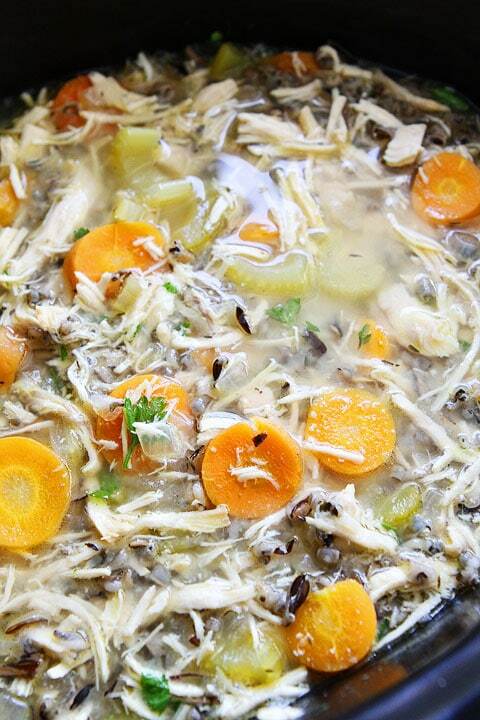 We shared our Chicken and Wild Rice Soup with our friends who just had a baby. They needed a good home cooked meal. Just don’t tell them that we didn’t do the cooking, our slow cooker did:) The slow cooker worked as our personal chef for the day! 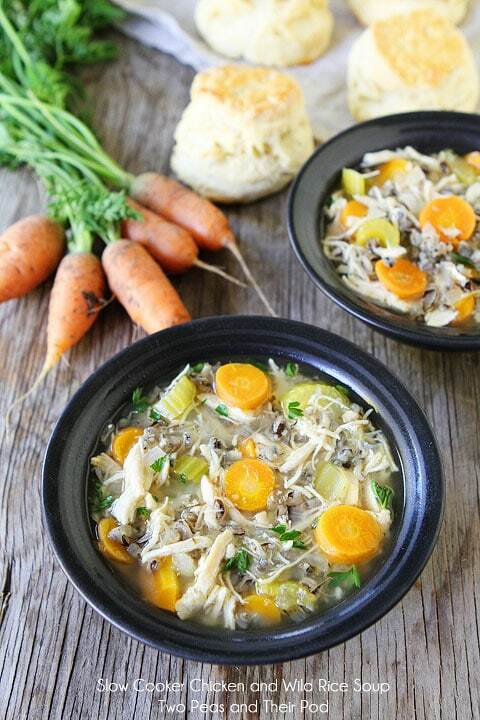 This Slow Cooker Chicken and Wild Rice Soup is healthy, comforting, and delicious! And the best part? It’s SO easy to make! 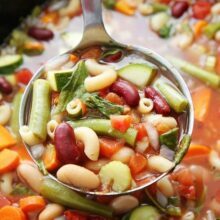 Pull out your slow cooker and make this soup for dinner tonight! And do you see those biscuits in the background? We will be sharing a killer biscuit recipe on Wednesday so make sure you come back! They are SO good with this soup! 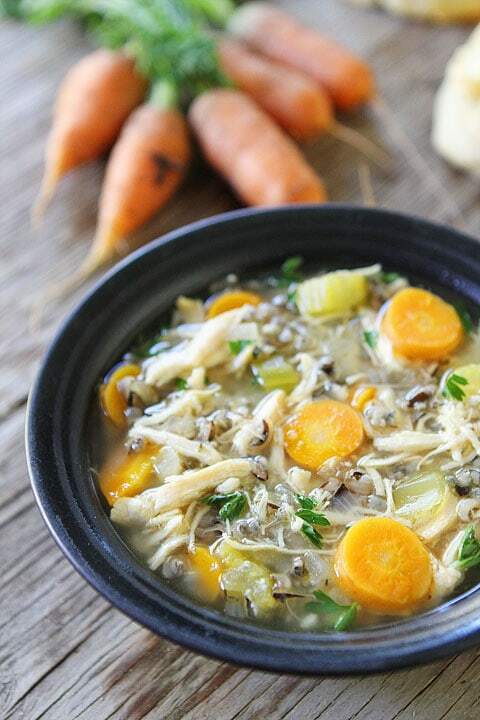 Hearty chicken and wild rice soup that is made in the slow cooker! This simple soup is always a hit! In a 6 quart slow cooker, combine onion, carrots, celery, garlic, wild rice, bay leaves, thyme, salt, and pepper. Top with chicken breast halves. Add the chicken broth. Place the lid on the slow cooker and cook on low heat setting for 6 to 6 1/2 hours or on high-heat setting about 3 1/2 hours. Carefully remove chicken and shred with two forks. Return to the slow cooker and stir. Remove the bay leaves. Add the parsley and season with additional salt and pepper, to taste. YES! 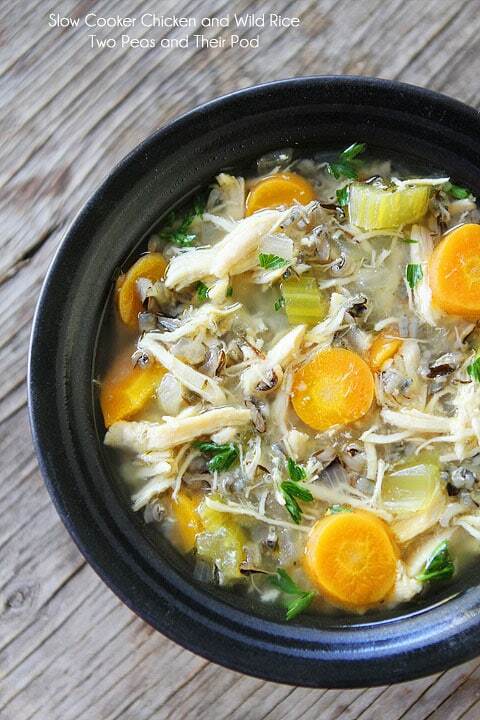 I have been dying for a slow cooker chicken soup. Two questions – could I make this with chicken thighs? I feel like every recipe that I make with chicken breasts in the slow cooker ends up with VERY dry chicken. Also, I can’t stand wild rice – could I add in white rice at the end? This looks sooo good! This is a keeper for sure… can’t ever have too many soup recipes. And I’m with Jennifer, those carrots are the cutest – did you grow them? This looks great! I don’t know why I never use my slow cooker either? I think I’m gonna go break my out of the basement! Looks so good! I’m pulling my slow cooker out to make this! Yum! 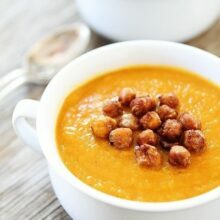 This soup looks delicious and perfect for fall! What a great post! Looking for something like this – my husband is allergic to potatoes and so many of the recipes use them … so this is PERFECT! Wonderful soup recipes, absolutely warm, comforting and inviting! SO glad you are on the slow cooker train! It’s a lifesaver. This is one of those recipes I could eat every single day! Always looking for new slow cooker recipes! This looks like a real winner 🙂 so flavorful! 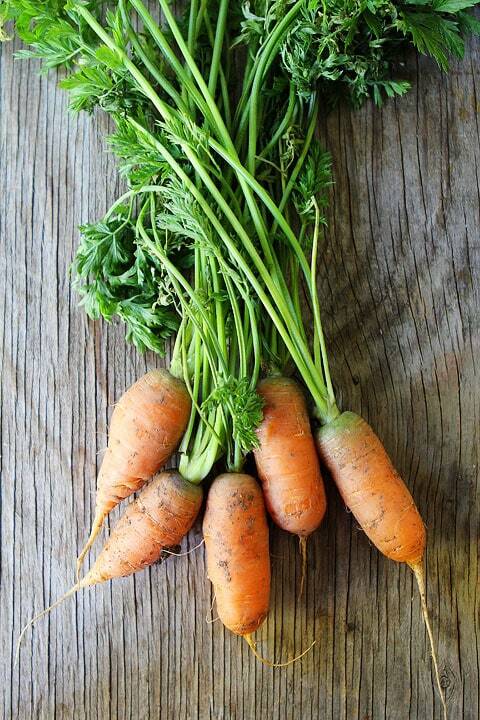 Loving those adorable carrots from your garden! 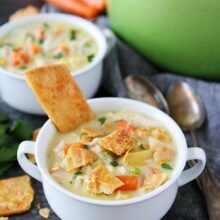 And this recipe — love slow cooker soups and this one looks phenomenal. Looks so easy yet so delicious. I live for my crock pot! Soup sounds good. I am already waiting for summer to return. Mmmmm yum! I love that you grow your vegetables in your own garden!!! I hope to someday do that! Your carrots are adorable, perfect little carrots! Do you notice a difference in taste? Slow cooker recipes are so easy, especially when you can come home to a ready made dinner after just throwing it all in there. Love to try it. I really need to make more soups in the slow cooker! This looks amazing! Yeah, to more slow cooker recipes! This looks perfectly cozy and fall – a must make! What a great soup recipe!! Anything made in a slow cooker is a win-win. This recipe sounds perfectly easy and looks wonderful. Credit to you! And your carrots–so cute! Congrats on growing some lovely produce and sharing how to make beautiful food with it! So beautiful, and warming! It’s so cold here right now, this would be perfect for dinner this week! Such a comforting recipe! Perfect for the cold weather! Oh my, those carrots look simply amazing! Chicken and rice in the crock pot is sure to make cold weather more enjoyable. Yum! This is so pretty and gosh, I love the slow cooker!! Such a perfect healthy November meal! Yum! I am wondering what size crock pot you used? I don’t want to put everything in my 4 quart pot and have it not fit! It sounds really good! This looks wonderful! I really need to pull out my slow cooker more often. It’s so great for an easy weeknight meal. What a tasty chicken soup! This soup looks and sounds incredible. I was wondering whether or not chicken thighs would work just as well? I’m so glad you finally saw the light! Slow cookers rock. 🙂 This looks fabulous…especially considering the cold front that is supposed to be moving in later this week…brrrrrr! I’m going to be craving something comforting like this! Can you use Uncle Ben’s wild rice? Looks delicious – can’t wait to try it! Thanks! This looks fantastic. Chicken wild rice is one of my favorite soups, and I love the use of the slow cooker to make it perfect for really busy days. Your carrots are so cute 🙂 Wild rice is one of my faves too. Loved the idea of this soup. I don’t use my slow cooker very much and when I do I am very unadventurous. I will be getting it out now that winter is almost here and trying out some of the fantastic recipes! My grand daughter is going to love this! thanks. Looks delicious! I love using my slow cooker this time of year. I’m impressed with Josh that he made a slow-cooker meal. My husband while pretty savvy in the kitchen, doesn’t do much with the slow-cooker unless it’s me asking him to shred the chicken that’s in it, lol! Looks like a great soup, JOSH. 😉 I hear you, though, Maria. I need to get the slow cooker out alot more, it makes such delicious meals! I think this soup will be on the menu here during the cold months ahead, thanks! Thank you for such great recipes I love your website! Was getting ready to figure out a quick dinner for the family with the chicken breasts I had taken out of freezer, and tonight a busy school night. I hopped on Pinterest & saw this post first in the feed, I knew it was meant to be. 🙂 It is now in my crockpot! Thanks for planning my dinner for me! THANK YOU for including the ‘print’ button. That is such a lovely feature. I put this soup in the crockpot before we went to bed the other night and it was done when we got up. Had it for supper that night!!! Awesome……… will make again….and again!! Any chance you could let me know what size slow cooker you used for this recipe? It looks really good, and I’m excited to make it, but I have a small crock pot, so I have to size recipes down for it. If you can’t let me know, I’ll just halve the recipe and see if it all fits! We have a 6 quart slow cooker! Had this in the Crockpot before lunch and enjoyed it for supper tonight. It was delicious!!! This was way easier than roasting the chicken and cooking the rice first! Thanks! I had this all ready in my slow cooker before lunch. After a busy day we had a very delicious supper!! So much easier than cooking the chicken and the rice first, then assembling the soup. Thanks!! so sorry I double posted!! My computer didn’t show my post…it just kept spinning a blank screen! I am making this now. So far so good except adding 1 whole cup of wild rice may be too much. Mine is not looking as soupy as yours due to rice to broth ratio. So so good. Who needs canned soup when you can make healthier, heartier and tastier recipes like this one! Thank you for another great recipe!! Im super excited I found this recipe! Looks really easy and with the freezing temps setting in I’m ready for some new soup recipes! Thank you! Making this today with leftover smoked turkey breast! Hi! Just wanted to let you know that I made your recipe and did a blog post about it. I adapted it some – I used brown rice and also added mushrooms and sauteed the mushrooms with the onions beforehand. Thank you for the fab recipe! Here is a link to my post. I made this recipe tonight and it was delicious, so aromatic, and a great way to incorporate wild rice. One note – next time I plan on only using only about 1/2 cup of wild rice, because there’s hardly any broth and this soup is super thick. For some reason your soup looks much brothy-er than mine. Small criticism, though – loved this recipe otherwise! I only have a 3.5 slow cooker and there are only two of us. If I half the recipe, does that science work for cooking time too? Or does it cook for the same amount of time? I’m new to slow cookers..
Every slow cooker is different, but it should take the same amount of time to cook. With that said, you don’t want to cut the recipe too much because if you barely have anything in your slow cooker it will burn on the bottom. This is in my crockpot right now. I am wondering if anyone has tried adding a bit of cream and flour? I love wild rice! So this is definitely a great recipe for me to try. Thanks! Made this tonight, was really good. Had to put it on my stove after 2 1/2 hours because my crockpot wasn’t getting hot enough, but it worked out fine. My picky boys even had seconds! Thank you for this excellent recipe! We’ve had a long stretch of snowy/windy days in Colorado, and this soup absolutely hit the spot–several times! I made a few changes based on what I had on hand–used 2 boneless chicken breasts and 6 boneless chicken thighs, organic nonfat chicken broth, 1/2 brown rice and 1/2 dark Hinode black rice and extra celery. Yum yum. Great flavor and filling. Cooked on high for 3 1/2 hrs. I am wondering if you have the nutritional breakdown? This is a keeper! Thanks. Good for this weekend Party. Could I add Savoy cabbage? Would it spoil the flavour. Also can I use brown rice instead….many thanks Jodie. You can use brown rice, the cabbage will change the flavor. Let me know if you try it! We made some last night – so good! I added ginger & diced sweet potatoes which took it over the top. Thank you for the recipe! I’m sorry but with high hopes I was sorely disappointed. The broth was terribly bland. Would have tasted better with chicken thighs as someone mentioned. Just made this earlier this week and it was perfect! I work and go to school full time so I like making stuff in my slow cooker to freeze/eat dinner at work before class, and this was perfect. I’ll never buy the canned Progresso version again! I made your soup! Wow!! It was awesome! I’ve shied away from crock pot chicken soup because I love to sautee the veggies first in olive oil. I love the flavor of doing that, but I was in a massive hurry this morning and found your recipe I pinned. I threw it together in 15 minutes and left the house while it cooked (I didn’t have chicken breasts thawed so I used thighs) It is WONDERFUL!! (wish I had homemade broth on hand at the time but I didn’t). I think I even prefer this recipe over my sautéed one:) The broth in your soup picture looks watery but following your recipe mine is much darker. I’m sure it depends on the kind of broth used. Mine was not low sodium so I probably don’t need to add the salt next time. Anyway, LOVE the recipe and thank you!! I substituted orzo for the rice. I threw it in an hour before end of cooking time. I also try and buy organic celery. Non-organic celery has a chemical/pesticide taste. It is worth buying organic even though price is higher. Do a taste test on the celery… notable difference. Thanks for great recipe! Yum! good job your article is very helpful.in this article i got large of information. This looks soo good! Do you think you could use long grain rice if you don’t have the wild rice? Or would I need to cook it first then add it after everything is done? Thank you for this recipe Josh. I love using a crockpot to cook in bulk and that night put in the freezer for quick last minute meals. I would never have though that rice could hold up to crockpot cooking. I assumed it would turn out mushy. Making this tonite!! The rice was so tough and crunchy! What did I do wrong? What spices would you recommend to kick this up a notch? It was a little bland for me. Thanks! You can add more thyme if you wish! 3.5 hours on high at sea level was not enough time for the carrots, and barely for the rice. I transferred over to the stove top and simmered/boiled for the last 45 minutes. I’m trying this tomorrow night! I can’t wait to try it and be able to post about it on my food blog about what I thought of it! Can I use already cooked rotisserie chicken? I love this recipe! Have a question regarding a substitution . I have leftover cooked turkey meat from a Holiday party . Could I use that in this recipe instead of raw chicken? At what point in the cooking process would you add the turkey meat? I posed a question a few days ago regarding if you could used already cooked meat in this recipe? I have leftover cooked turkey from a party and was wondering if I could use it and if so when in the cooking process do you add it and is it still 2 lbs cooked or less? 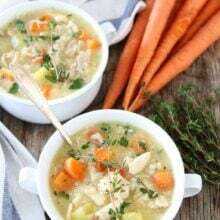 Making this soup now and smells yummy but mine does not look as clear a broth as the picture and just had to skim and strain off lots of ‘chicken scum’. How do you avoid that? Please could someone tell me how to avoid ‘chicken scum’ with this recipe? Soup was tasty but didn’t look as clear as the the picture. Pingback: THE 15 BEST HEALTHY CROCK POT RECIPES! Camp opens April 15th and the soup sounds great,may half to try it sooner because Spring is chilly. tHANKS! I don’t have a crockpot but I’m interested in one — how did you work all day when the recipe says leave in the crockpot for 6.5 hours? Are there crockpots that allow you to set them safely for longer, like 9 hours? Thanks! Serving size and calorie amount? Are you using skinless/boneless breasts or just skinless?? Made this yesterday, and it is truly delicious. I love my slow cooker and use it religiously. This is probably my fav chicken and rice recipe. The only thing I do differently is I only use parsley, garlic cloves, salt and pepper. And I use brown unbleached rice instead of wild rice. If I’m going to be home sometimes I will use no yolk egg noodles instead of rice but if you do that wait to put in the noodles until the last 20-30 minutes or you’ll have mush. And to the one asking about subbing chicken thigh for breast.. You can use what ever chicken you like but keep in mind thigh have a lot of fat content and if breast moistness is the problem I normally cook mine the night before then add everything to it the next morning and it’s done in about 3 hours on high and my breast as always nice and tender and juicy. Made this last night. It was delicious! It cooked to the perfect texture, not mush like so many slow cooker recipes. Easy and definitely a keeper. Thanks! My kind of cooking ! Forget the sugar, honey and chocolate on fresh vegetables and every other herb to kill the taste of whatever you are trying to cook. Keep it simple and pure! First time out with this, but I know it’s going to be good! Just put this soup together to surprise my girlfriend with a delicious smelling soup on this chilly rainy day for when she gets home from work. I followed the recipe but added a couple red potatoes that were laying around. It was very easy to put together and I’m hoping it tastes as good as it smells! Where can I find the calorie count for this ?? What if I already already have leftover shredded chicken? How do I modify and cook with it? Can’t wait to try. This looked so good and made my house smell amazing. I was a little disappointed with the outcome. Way too much stock, and not near enough veggies & rice. My daughters loved it, but my husband and I felt like it needed more.